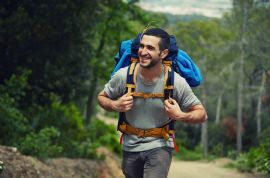 Enjoying nature is one of the simplest, yet most fulfilling things to do in Cyprus – affordable, doable for all ages, safe, and possible all-year-round. From taking on some of the fantastic hiking trails, to simply walking in nature and experiencing the flora and fauna of this nature-friendly island. 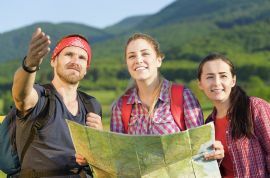 Before offering more information specific to hiking trails, it’s worth highlighting the key aspect of Cyprus’ nature-based tourism offering. In many ways, Agrotourism is all about getting a feel of the local nature. As one of the largest Mediterranean island, Cyprus is a truly unique destination in terms of nature, with great diversity within close proximity. Indeed, it is easily possible to see a great variety of natural aspects (or other sites/things to do) within the one or few days, such as the highlands, forests, countryside and farmlands, villages, cities, and vast diverse coastline. As the famous saying goes during the winter months, “ski in the Troodos Mountains and swim in the Mediterranean Sea in the same day”. Cyprus is a great nature-based destination. Not least due to its year-round sunshine and therefore endless options for outdoor activities. – Tolerant, safe and stable environment, culturally and ideologically. Also worth noting, is that when speaking about nature, it is not only flora and fauna. For instance, consider exploring the nature below – the geological wonder of Cyprus’ Troodos Mountain range, formed in the Upper Cretaceous (90 Ma) on the Tethys sea floor, which extended from the Pyrenees through the Alps to the Himalayas. The Troodos Terrane or the Troodos Ophiolite complex dominates the central part of the island, constituting the geological core. The Troodos Ophiolite, which is a section of oceanic crust created about 92 million years ago in what was then the Tethys Ocean. This ophiolite was later thrust, through complex geological processes, almost 2,000 meters (6,500 ft) above sea level. It is regarded as the most complete, intact and studied ophiolite in the world. And don’t forget the nature above! In other words, the ideal climatic conditions in Cyprus allow you to enjoy excellent views of the cosmos above. The amazing, mega and inspirational sunrise over the mountains or coast, together with its balanced, blazing sunset. The new and full moons, bright and powerful, as well as of course the never-ending sparkling stars. Many times this is a neglected aspect of Cyprus’ nature appeal. Take some time to enjoy the early morning, or late nights, within a natural environment such as the village of Farmakas. Hiking means experiencing the nature up-close and more personally – the sights, sounds and smells of nature. In your own pace, walking by the island’s spectacular flora, seeing its fauna, and enjoying the diverse and panning views. At the same time, passing by sites; of history, culture, or just a local village. Cyprus has many designated and signposted hiking paths or nature trails. These have been specifically designed by the Forestry Department to cover areas of rich natural vegetation and cultural interest. Some are more challenging than others, but all certainly enjoyable. 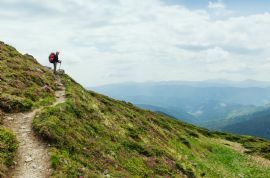 Hiking paths in the mountains, forests, through countryside, along the coast, and all of the above! Depending on the time of the year, experiencing different natural offerings; different views, different blooms. For instance, pine forests, vast variety of wild fruit trees, waterfalls, snow, spring, an indigenous villager, and more. Almost all paths have names deriving from mythology. This is not a coincidence since each path is associated with a legend of the area, giving to each path a touch of magic. 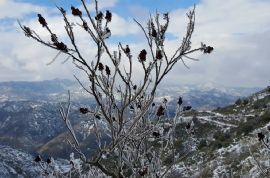 In the Troodos range, four main trails cover the area – “Atalante” goes round Mount Olympus; “Persephone” leads to a spectacular viewpoint; “Kalidonia” leads to the Caledonian waterfalls; “Artemis” encircles the Chionistra summit. Other trails go across the Madhari ridge.